Dispenses a full 8 oz per stroke. Adjustable for 2, 4, 6 oz. Model PUMP-80A fits 5, 15, 30, or 55 gallon drum with 3/4" or 2" drum opening. Model 80-GA fits 3, 5, or 6 gallon drum. Model PUMP-160F fits 5, 6, 15, 30 or 55 gallon drum with 3/4" or 2" drum opening. Model PUMP-160GF fits 3, 5, or 6 gallon drum. 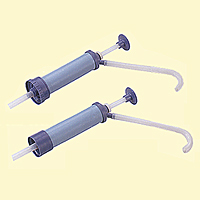 Model PUMP-80A and 160F furnished with 40cm and 42cm tube. Model PUMP-80GA and 160GF furnished with 48cm extension tube. Material characteristics stands insulatively to any spark and fire accident, free from danger. For dispensing distilled or bottled water and chemicals in pail drum.